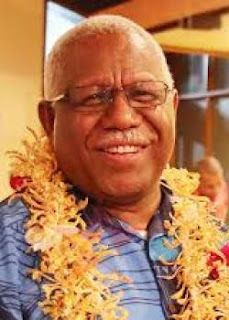 Solomon Islands Democratic Coalition for Change (SIDCC) Government under the leadership of Prime Minister Rick Hou has no policy statement on West Papua. Hou revealed this while responding a question from a journalist over the government’s stand on West Papua, in a press conference last Friday. He said Government has nothing to do with the issue of West Papua because there is no government policy on West Papua. Prime Minister Hou said there was no discussion on the West Papua issue during his bilateral meeting with the Indonesian president, Joko Widodo at the recent APEC in PNG. “For me, I see everybody as I see anybody. “I see Australia just as I see China and I see China just as I see New Zealand,” he said. He added if New Zealand has Maoris and the Maoris have problems, it is the New Zealand government who will address the problem, the same with Australia and its Aborigines. Hou said if any issue arises in a certain country, it is a matter of concern for their government or leaders to address it. When asked why he has a different take on that issue to his Deputy, Manasseh Sogavare during his leadership, Hou said everybody is different with different views. “I suppose we have different views because we are different and of course everybody is entitled to their own views. “If you think you have better information than me and that you based your views on the information you have then I also based my views on the information I have. “When we talked about West Papua, it comprises of Melanesians with total population of less than 800,000 but the Melanesians in Indonesia is 30 million. “So when people talked about West Papua, who actually are they referring to? And if we talked about Melanesians, then we should be talking differently,” he added. The PM’s statement is totally contradicting to the former Prime Minister and now his Deputy. During his tenure as Prime Minister, Manasseh Sogavare was one of the active members of the Melanesian Spear Heard Group (MSG) voicing out issues faced by West Papua in trying to earn their freedom from Indonesia.